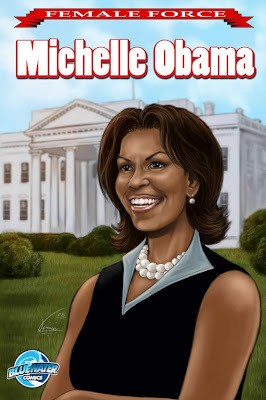 The Ant & Mike Show - "We Do More Than Gossip": Michelle Obama...the Superheroine? First Lady Michelle Obama will be on her way toward becoming a real life Superwoman next month when a biographical comic book arrives on newsstands. The comic is part of the "Female Force" series showcasing powerful female leaders. This issue will chronicle Michelle's upbringing, college years, and how she helped Barack reach the white house. Issues featuring Alaska Gov. Sarah Palin and Secretary of State Hillary Clinton sold out immediately upon their release earlier this month. The publisher of "Female Force" believes that the Michelle Obama edition will be even bigger than the Clinton and Palin editions, which are already on their second printings. The comic book will be released April 25 and will sell for $3.99. Make sure you pick one up, it's definitely a collectors item. I love the Obama's, but I think they are going as far as you can go without saything the obvious and that is they are being treated like gold because they are black. Bill Clinton nor Bush had their own trading cards, comic books, or clothing line lol(Obama had everyone including us Fli Pelican making a shirt) I think it is time to let President Obama work and Madam Obama just be fine rather than jocking their fresh on every move!